It thrills me to welcome Raffaella (Raffa) Tolicetti to Our Hen House today! 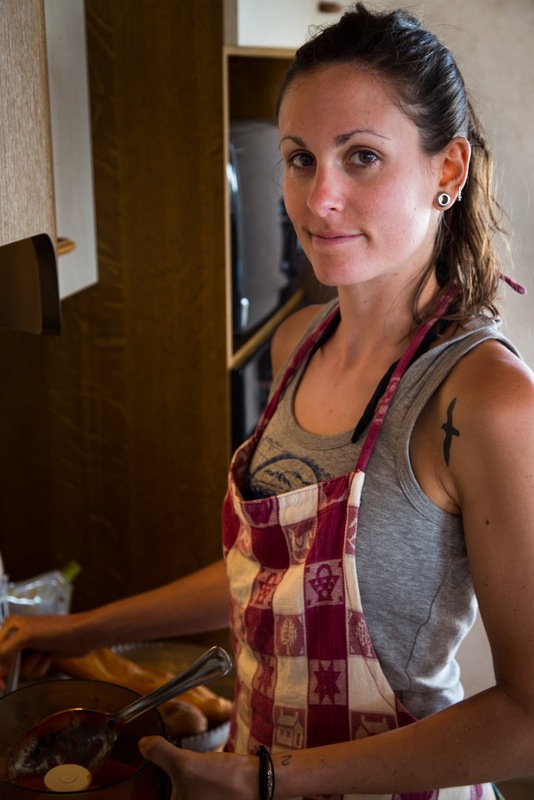 Raffa has not only been an integral part of several Sea Shepherd campaigns since 2010, but her work as the Chief Cook in the galley has led her to a very exciting new cookbook – Think! Eat! Act! A Sea Shepherd Chef’s Vegan Recipes – which will be released in July. 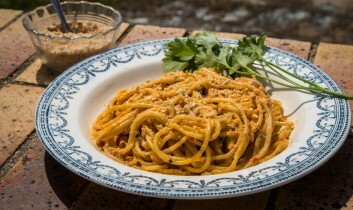 Today, Raffa is giving us a glimpse into her inspiring story how she went from a Political Science major to the powerhouse activist she is today, and she’s even sharing an original recipe for Vegan Roasted Pepper Cream Spaghetti. I never thought I would become a cook – certainly not a cook on board a ship. But somehow it happened anyway. It started when I subconsciously followed the steps of my great-grandfather, joining the crew of a ship in the same European port he himself had embarked from almost 100 years before me, in the galley, just like him. My own journey brought me to other hemispheres, to places my great-grandfather himself had travelled – far-off lands I had always fantasized about visiting. But my ship wasn’t a navy ship like his – although ours has indeed been mistaken for a military vessel, due to the camouflage painting and impressive aspect, with bones and skulls painted on the hull. The ship I joined was the Steve Irwin, part of the Sea Shepherd’s fleet that travels the world in an effort to protect, defend and conserve the oceans. When I took the bold step to join the Steve Irwin, I was just fresh out of a degree program in Political Science and had no experience whatsoever on ships, but I felt the burning urge to do more to fight for the environment and the animals who are being exploited and killed everyday. Because I am vegan (thanks to my partner who opened my eyes to the exploitation behind the dairy industry, and helped me move from vegetarianism to veganism), it particularly appealed to me to be able to join an organization that had a vegan policy on board its vessels, as not many environmental and conservation NGOs make this coherent decision. I always felt that the protection of the environment and the protection of animals, including ourselves, were strongly connected, and that we couldn’t face one issue without an inclusive approach that recognized all the relationships within the ecosystem, which functions as a whole and cannot be divided. The exploitation and ending of billions of lives and the destruction caused by intensive factory farming and poor food distribution leading to human hunger are related issues that can be addressed in many ways, but first and foremost by veganism. My mantra had always been that revolution begins in the kitchen, and so somehow it just felt natural to bring my activism to the galley of the Steve Irwin. As a cook on the ship, I sailed from Europe to Australia, through the burning seas of the golf of Aden, where we had to do pirate watches day and night, and had spikes positioned all around the ship to prevent boarding. As a crewmember, I got my first experience of what sea sickness really meant – not two hours on a ferry feeling a bit weird, but weeks on end of relentless nausea, weakness and dizziness, all while helping to cook four meals a day for 25 people. Throughout this experience, I learned to fight against my body like never before, pulled by the strength of my conviction that I had the responsibility and the duty to do something for those who have no voice and could not defend themselves against the arrogance of those who have the impunity to destroy everyone in their path, until someone stops them. I desperately wanted to be a part of the team that stopped them. And so I forged on. As a chief cook, my responsibilities started before we ever left the port, as I always made sure our dry stores and cold rooms were fully stocked, primarily with donated food, before we went to sea so that we would have enough to last through the entire campaign. Once at sea, our typical day in the galley ran from approximately 6 a.m. to 6 p.m. For the three months of the average campaign, we had the responsibility of cooking balanced and varied meals four times a day for a crew of up to 45 people. Cooking at sea can be difficult for a number of reasons, but the extreme weather is probably the greatest challenge. No matter what the weather – and I have experienced every weather condition possible – we never had any choice but to keep on cooking. I’ve had cakes fly from the oven to the floor; received burns from boiling water pouring out of the pot when big waves made us roll; seen fridges tear off the wall and bang onto the other side of the room. I have cooked, or attempted to, in the angriest storms you could imagine, and I have even been busy cooking while my ship was rammed several times by one that was eight times heavier. But even though there have been times when being on the ship was physically and mentally exhausting, I’ve always known that I wouldn’t want to be anywhere else but there, doing something that really matters – something that is desperately needed if we want to continue to live as a species on this planet, a planet we share with so many others. We simply must be there, on the sea. No one else would send a ship to patrol the Antarctic sanctuary, which should be off limits to human exploitation. And while, every time we see poachers and environmental criminals, we confront the darkest face of humanity, we also get to meet some of the greatest, most passionate and dedicated human beings out there. Indeed, joining the ship back in 2010 was, and remains, my greatest source of inspiration. After a few years learning from so many people, not only as a cook but also as an individual, I wanted to give back. I felt it was my turn to inspire other people and share all I had learned from my time in the galley. That’s what led me to write a vegan cookbook that doubles as a tribute to activism. 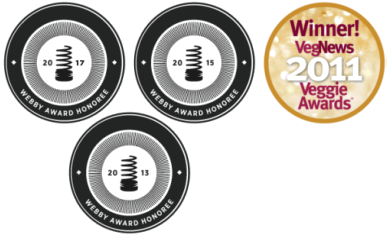 It includes not only recipes, but information and interviews about environmental and animal rights campaigns, from some of my friends around the world. It is my hope that, through these stories, more and more people can be touched and feel for themselves the urge to think, eat, and act in a conscious way. Only in this way will we come to know that each of us owns the solution within ourselves. This recipe is a variation of one in my cookbook, Think! Eat! Act! A Sea Shepherd Chef’s Vegan Recipes. I put this version together just for Our Hen House! I cook quite a lot of Italian food on the ship, both because it is the cuisine I grew up with, and because crewmembers tend to love it and request it over and over. Pasta is particularly important to me, as the way we eat it in Italy is totally different from the way I have seen it cooked abroad, and I have never been able to enjoy it outside Italy. My mission on the ship was partly to bring Italian pasta back in style, and a whole chapter of my cookbook is dedicated to just that! In Italy, you don’t serve pasta and sauce separately. The pasta is cooked al dente, then drained and mixed straight away with the condiments, and served. We Italians do not put cheese (by which I obviously am referring to vegan cheese) on pasta every time we eat it, as cheese is usually kept aside for people to add only if they want to. Most importantly, it is the quality of the ingredients that make the meal, so fresh vegetables from the farmer’s market are always preferable to supermarket produce. * If you cannot find non-dairy cream, substitute ½ C non-dairy milk, or make your own vegan cream by blending cashews and water to a creamy consistency. Preheat your oven to 200°C (400°F). Meanwhile, wash the peppers and put them on a non-greased baking tray and remove the bigger stems of the parsley. When the oven has reached the right temperature, bake the peppers. After 15 minutes, turn them and add the garlic cloves. On another tray, add the almonds to roast for five minutes. Remove the almonds first, then, when the skin of the peppers has black burns and they are soft, remove them and the garlic. While you let them cool in cold water, put the water for the pasta to boil, and cook according to instructions. Grind the almonds in a food processor and put aside. Peel the peppers and the garlic and in the same food processor, and blend them with the parsley and the cream. Pour over the pasta when ready, and mix well. Garnish with the almonds, a few fresh parsley leaves, and olive oil. 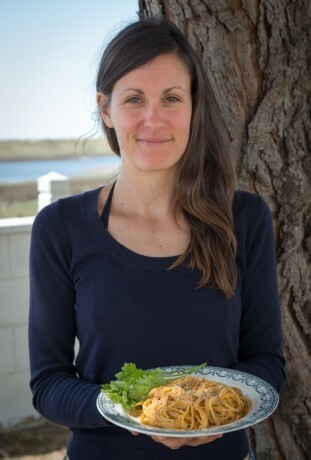 Raffaella (Raffa) Tolicetti is a French-Italian activist and vegan cook. 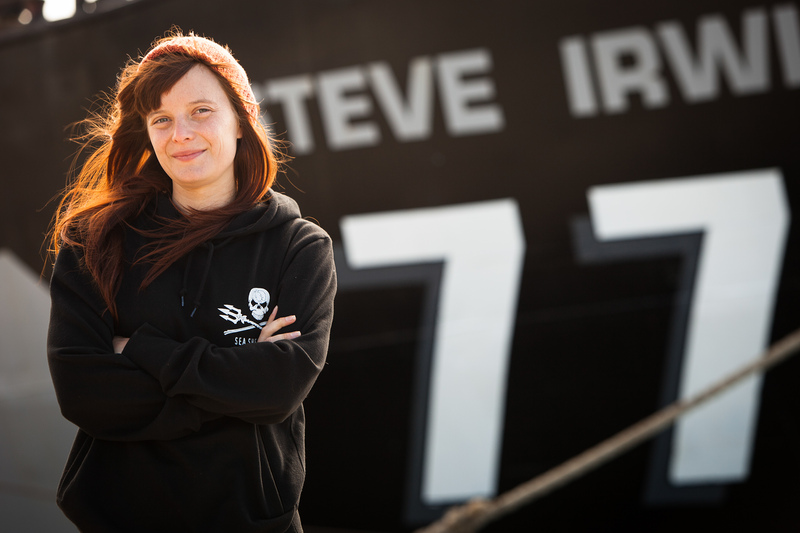 Before joining the Sea Shepherd, she spent most of her life in Paris and then in Rome, where she volunteered with projects that included teaching Italian to immigrants, co-creating an NGO for the promotion of human rights in Burma, and defending the recognition of homosexual civil rights in Italy. Raffa also graduated college with a degree in Political Science – and she accomplished all of the above while eating quite a lot of pizza, pasta, and other Italian goodies. In 2010, she joined the Steve Irwin, embarking for a long journey as a vegan cook, and eventually served on three different ships – the last being the Sam Simon, the closest place to a home Raffa can imagine. Her first vegan cookbook, Think! Eat! Act! A Sea Shepherd Chef’s Vegan Recipes, will be released by Microcosm Publishing on July 1, 2014. The book is not only full of recipes and pictures taken on board the ship during campaigns, but is also full of information about on-going campaigns around the world, featuring interviews with the Hunt Saboteurs, the Vancouver Animal Defense League, Eric McDavid (vegan prisoner), Jake Conroy (one of the SHAC 7), Sea Shepherd, Australia Shark Defense, and many more. A voice for the voiceless and a support to the activists, this book aims to reach as many people as possible, showing that the food we eat, the choices we make, and the actions we engage in are intimately connected.